#painPOP – Do You Have The NERVE To Be Heard? I have the nerve to be heard, do you have the nerve to be heard? POP for PAIN with hashtag #painPOP by the Power of Pain Foundation. We invite you to take the challenge or donate to either spread continued awareness and advocacy efforts or assist in educational funding for nerve pain diseases, syndromes and conditions. Our balloons are safe for both you and the environment. Instead of a balloon release, our #painPOP offers you the opportunity to be involved even with physical limitations. We considered the noise in the pop, we considered those whose hands are not well and we considered the air. We have taken into account those with PTSD from wartime. We would not wish you harm in any way, nor would we have you pop to startle you. No one is forced to do either. This is meant for fun, a distraction from our own pain; enlighten pain in others, and to promote understanding, compassion and hope. I participated in the ice bucket challenge last year and my body had a fit, but for ALS sufferers, I did it. I don’t have ALS, I have CRPS, CSA, OSA, other sleep disorders, Cheyne Stokes, Hypertension, Anxiety disorder, DDD, Arthritis (Juvenile Arthritis), PTSD and various extras. Pain is hard, not being able to breathe evenly is hard, having a brain that doesn’t send the proper signals to the muscles that control breathing is hard, not being able to stay awake is hard and not being able to sleep is hard, being on my legs is hard, but we don’t always have to be hard on ourselves. I was challenged in the #painPOP by Power of Pain’s Executive Director Ken Taylor. Of course, I accepted, even though I’ve been quite unwell for weeks now. If we tell ourselves we can’t participate in anything due to the setbacks in pain then we never will. If your balloon has a POP (Power of Pain) logo, be sure to have it facing the camera. You can have fun with it. Be creative. We also want you to be safe and content. We look forward to sharing your submissions and celebrating with you. * Providing educational resources for physical and emotional care * Advancing excellence in pain awareness of the over 150 conditions involving chronic pain and what patients are faced with on a daily basis * Strengthening our relationships with hospitals, pain clinics, pharmaceuticals, support groups and our chronic pain community * Demonstrating social responsibility through the use of our pain resources. The commitment of volunteers, physicians, community partners and friends to the Power of Pain mission, permits us to maintain a quality presence and tradition of caring, which are the hallmarks of the Power of Pain Foundation. We hope that you participate in our #NERVEmber projects and if you are unable due to any restrictions that instead you share someone who has so that together we can fulfill the mission of the Power of Pain Foundation to give a voice to the communities that need it most. 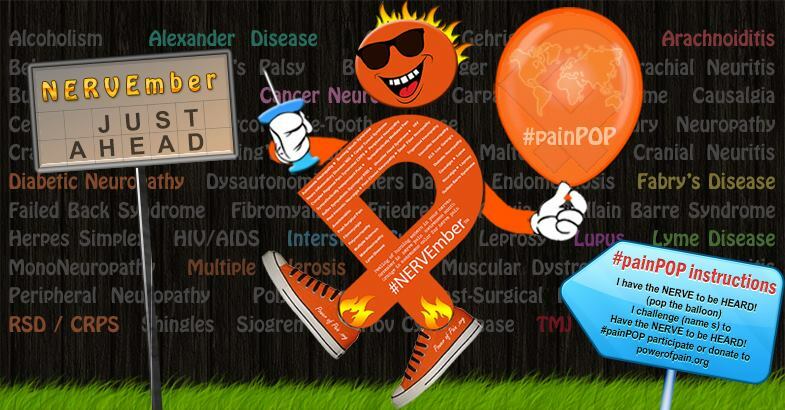 #NERVEmber is International Nerve Pain Awareness Month (including RSD, CRPS, Diabetes, and more). Each day during the month of NERVEmber the @PowerofPain Foundation will present an awareness task that we can all perform! This year we are also giving away over $1000 in prizes available for everyone who registers to participate and use the hashtags, complete tasks, host or attend an event. The more you participate in OFFICIAL #NERVEmber events, the more chances you have to win! Check out all events going on in our NERVEmber Event Calendar. A list of diseases, syndromes and conditions that involve nerve pain as a symptom. The autonomic nervous system is a control system that acts largely unconsciously and regulates the heart rate, digestion, respiratory rate, pupillary response, urination, and sexual arousal. This system is the primary mechanism in control of the fight-or-flight response and its role is mediated by two different components. Autoimmune diseases arise from an abnormal immune response of the body against substances and tissues normally present in the body (autoimmunity). This may be restricted to certain organs (e.g. in autoimmune thyroiditis) or involve a particular tissue in different places (e.g. Goodpasture’s disease which may affect the basement membrane in both the lung and the kidney). Other types of neuropathy conditions include; toxic, metabolic, trauma, compression entrapment, infectious, and congenital hereditary. These conditions are typically treated by multiple types of medical professionals. The goal of treatments should be to understand the physiological system of the condition and then working to prevent permanent painful neurological transformations.